This fragment is enriched with two rows of palm leaves, the upper rising from behind the lower in a double layer. At the bottom, a single row of small ivy(?) leaves in a single layer over the lower palm leaves. A good example of how genuine fragments like this one were used to 'restore' or create new candelabra in the 18th century is the shaft of a candelabrum in the Vatican Museum in the Galleria dei Candelabri, which consists of similar fragments1. The curled tips of the leaves were, probably as in this Soane fragment, chipped off, but were remodelled by the restorer. 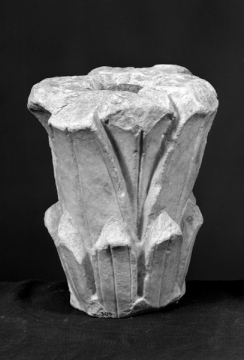 Compare this fragment also with the Piranesi candelabra in his Vasi Candelabri Cippi. The famous Barberini candelabrum was owned by the restorer Cavaceppi, before it entered the Vatican collection. 1 Hans-Ulrich Cain, Romische Marmorkandelaber, Mainz, 1985, pl. 83, 2, No. 105, pp. 188f. Tatham: Etchings, 12; Drawings, 11.